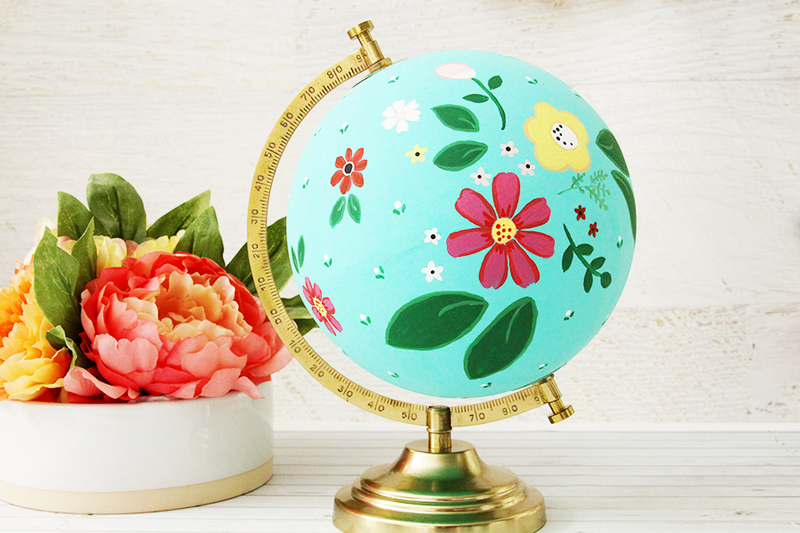 I have been dying to make a floral painted globe for ages, but I just couldn’t bring myself to paint over a vintage globe. The wait is over though! 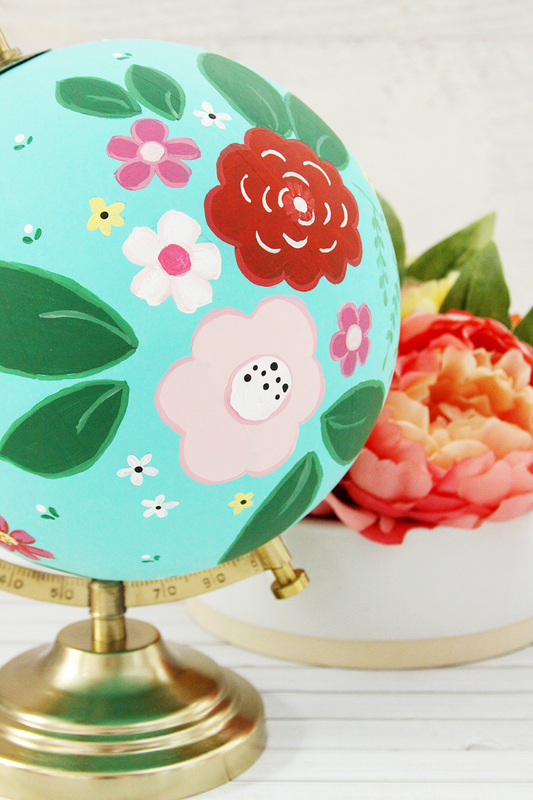 I found a globe at Target and it worked perfectly. 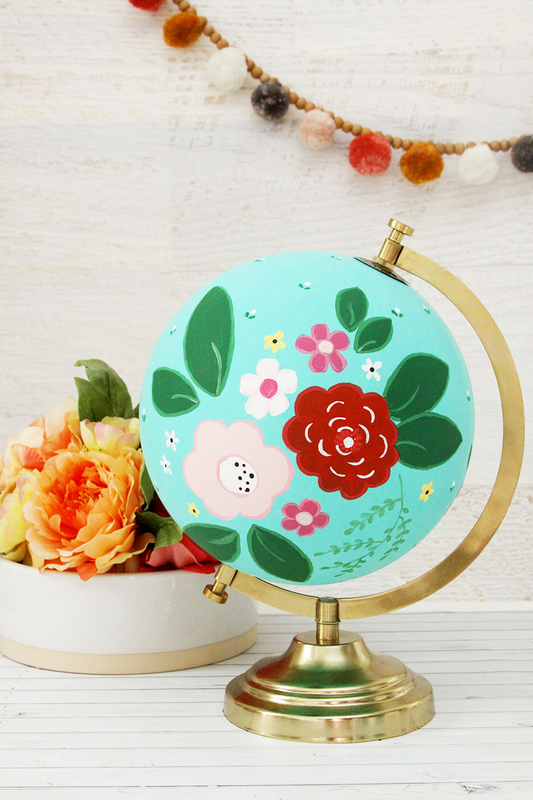 I love how this DIY Floral Painted Globe turned out and it was so easy to paint, especially since the paint was from Target too! 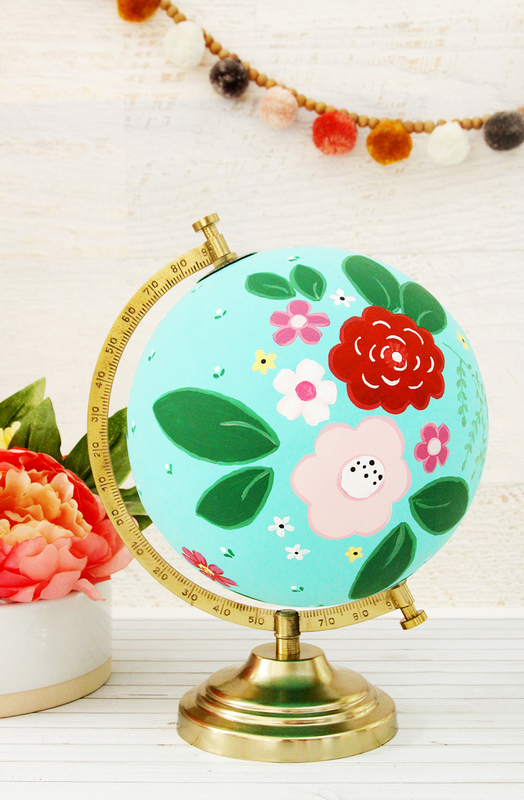 I painted mine with the bright, vintagey colors I love but you could make yours up with neutrals or pastels and that would be sooo pretty too! I’m always shopping at Target and I love that they have a craft department now! It’s fun to pick up some cute things to make when I’m getting all the essential stuff too. They’ve just started carrying Delta Ceramcoat® Acrylic Paint and it works perfectly for this kind of home decor paint project! 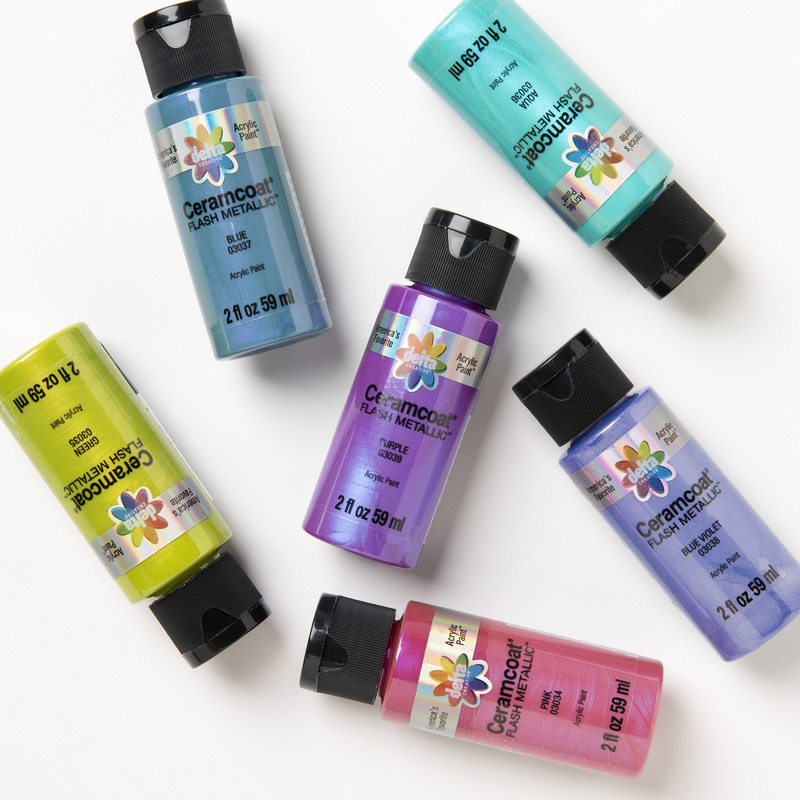 It has a great creamy coverage so you don’t have to do a bunch of coats and the colors are so vibrant and pretty! 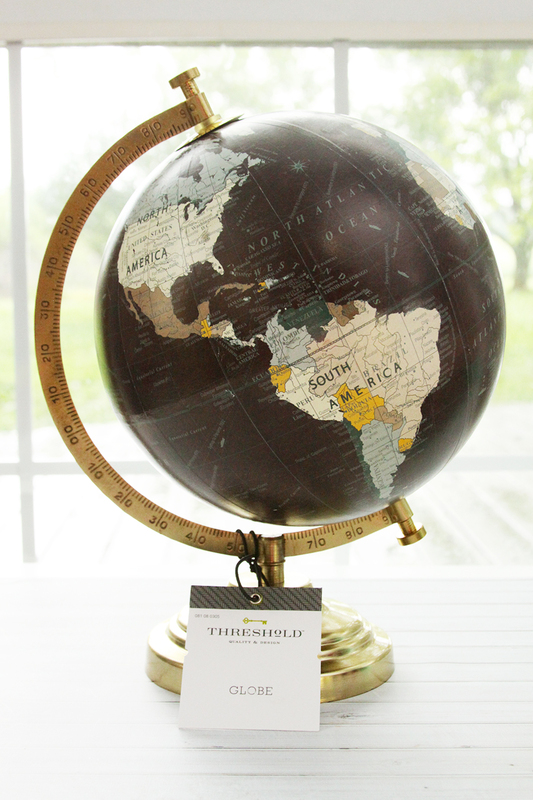 It works great on wood, paper mache’, terra cotta and plaster and it’s Made in the USA! You can find all the colors you want since it comes in 22 pretty colors and if you want to do a project with metallics, they also carry these gorgeous Flash Metallics! 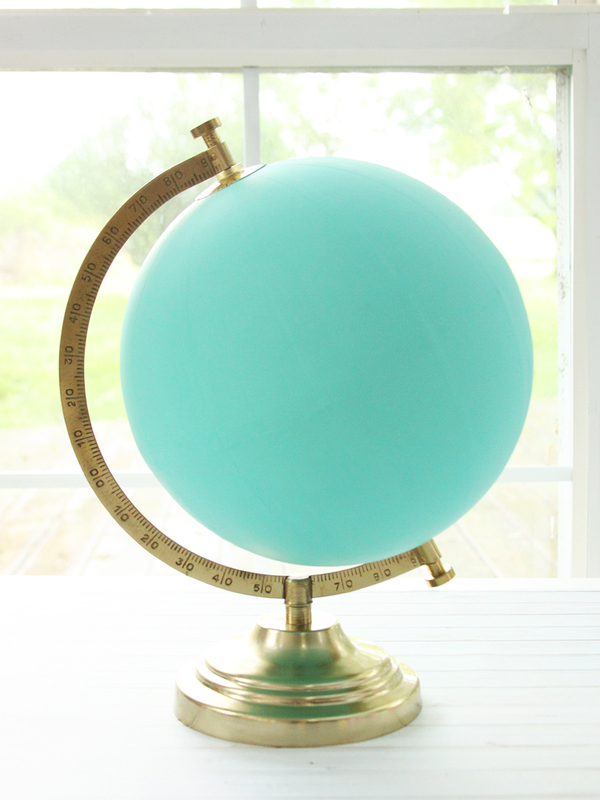 This Globe is a great size – it’s 12″ x 10″ so it looks so cute on a shelf or mantel. 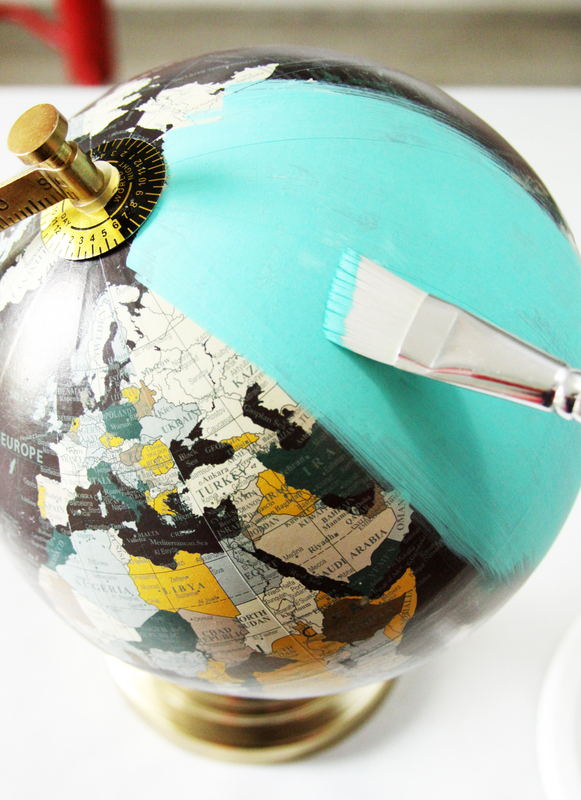 Start by covering the globe with a basecoat of paint. You want to make sure you have a solid base coat to work with. 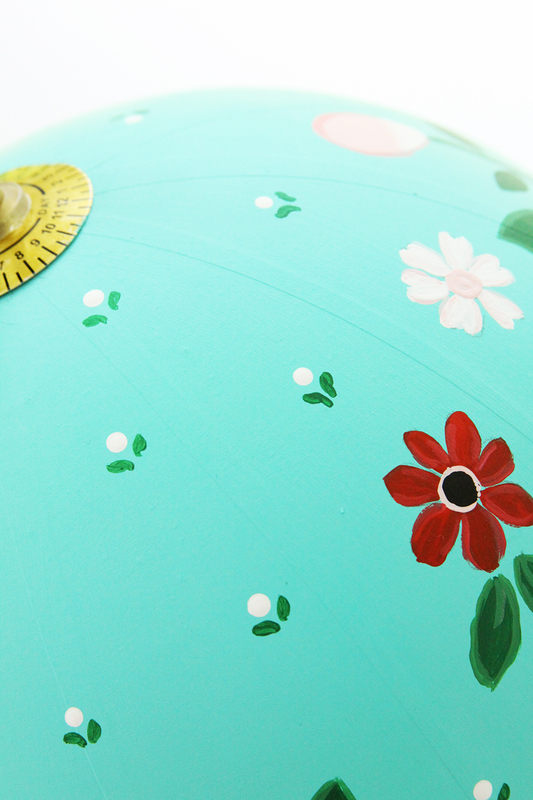 Keep painting until the entire globe is covered. Now draw on the designs you’d like to paint. I used a combination of flowers, but you could do anything! Use a light pencil to draw on the design, the paint covers it up so you don’t have to worry about seeing it after you paint. Start painting in your flowers. On some of these I did two coats of paint, just so the base coat didn’t make the color look different. Add in some highlights, outlines or shading to give the flowers some depth. 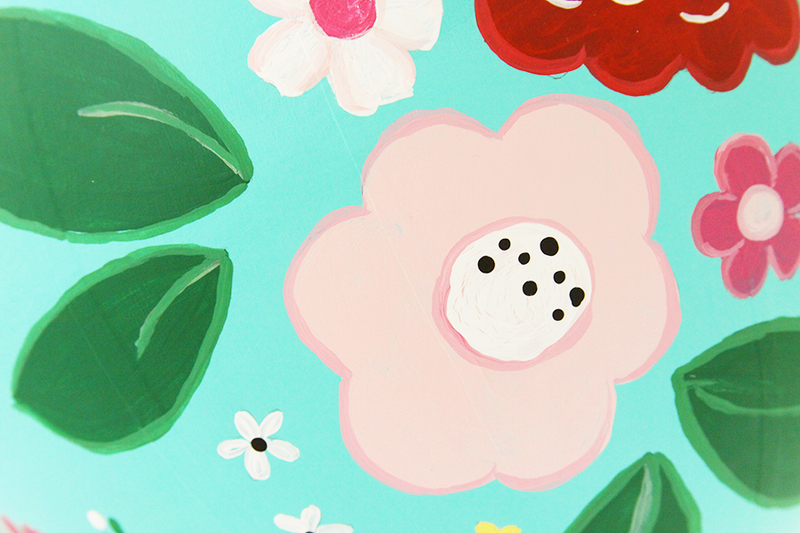 I painted a couple of groups of large flowers on each side, then filled in with smaller flowers and these little polkadot flowers with leaves to give it an all over floral look. 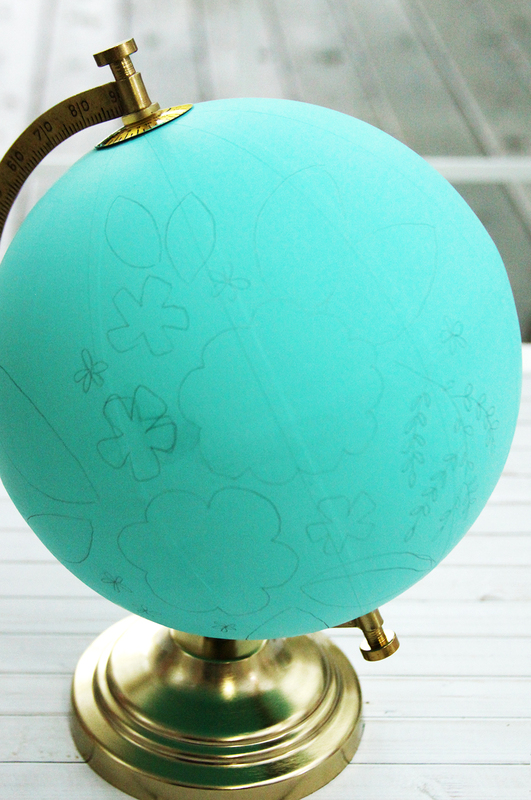 If you want the globe to have a glossy look, you can finish it off with a coat of glossy Mod Podge! I like the matte look of the paint so I’m leaving mine as it is. I love how it turned out! 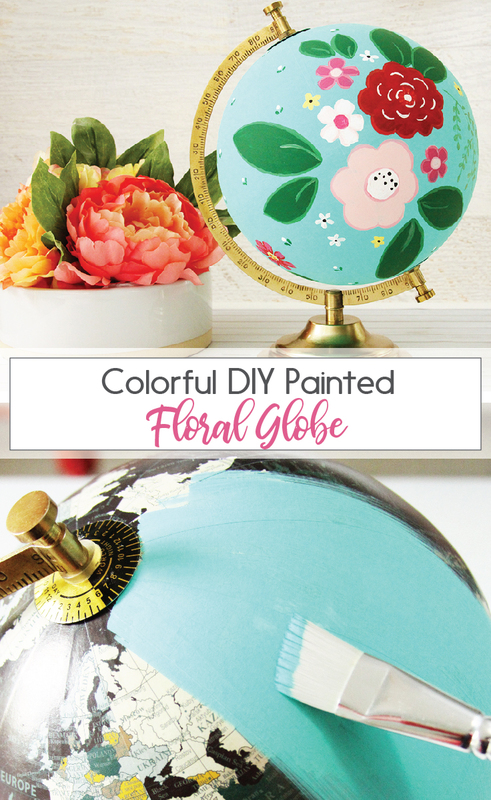 I hope you give this DIY Floral Painted Globe a try! 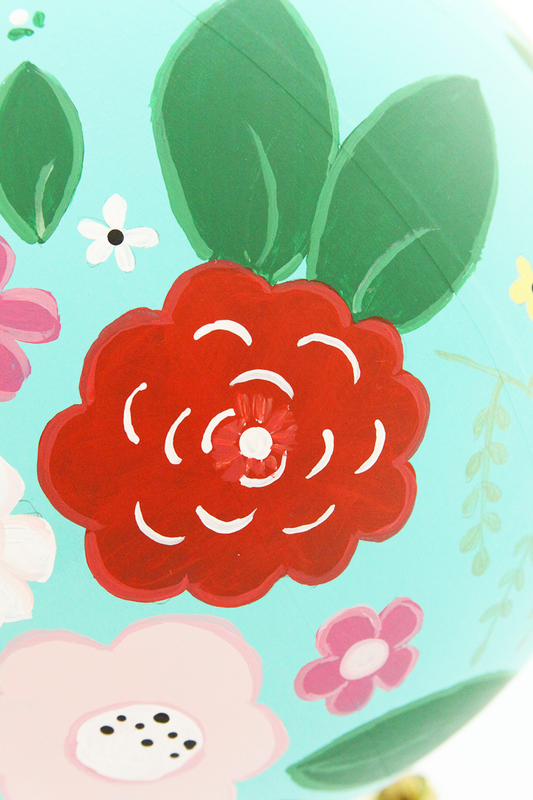 I can’t wait to play with this paint a little more – I think I need to make up some painted wooden bowls soon. Make sure you check out the craft aisle and all the Delta paints when you’re at Target next! Check out these fabulous projects from the other Plaid Creators! 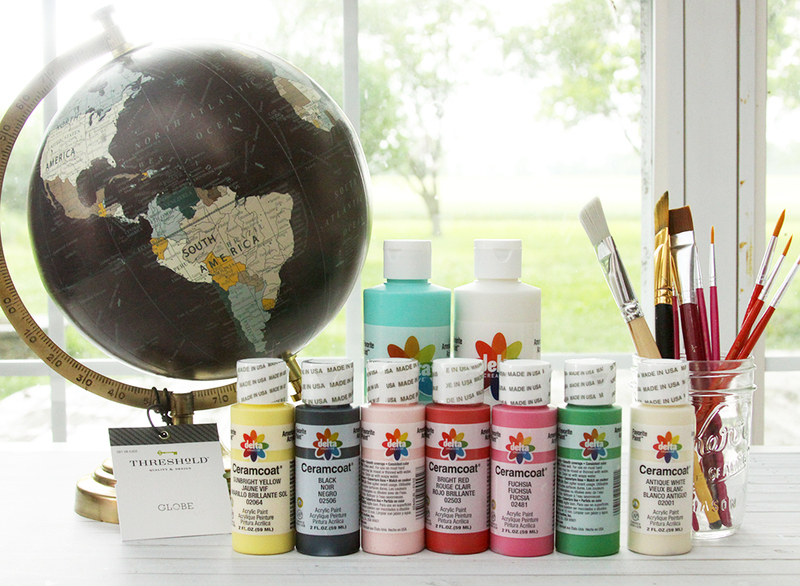 You’ll be painting up a storm with all this inspiration! Wow, I never thought of a project like this. Very pretty! So pretty, love how it looks! I’m a fan for anything with florals. Such talent, when I first saw this I thought it was decoupage, to my amazement the world is hand painted, beautiful! Thank you for sharing on Friday Features #omhgff this week!! What a great idea! So pretty with the florals and the color! Wish I would have kept those old out of date, well used globes I threw out. Guess I’ll be keeping my eye open at the thrift stores now. Thank you for sharing this at our Encouraging Hearts & Home Blog Hop this week. So cute! Featuring this on today’s OVER THE MOON LINK PARTY which goes live this evening at 5 pm central. Please stop by to see your feature and link up again! Thank you for sharing your post on Oh My Heartsie Girls WW last week! This week it is being featured, hope you will stop by and share again!! It has also been Pinned to Pinterest!! Now wishing you a great week ahead!! Such a cute idea! Thanks for sharing at Home Sweet Home! That came out great! I have not noticed paints at our local Target but I’ll be looking for them next time I go. Thanks so much for sharing with us at the Love to Learn Linky party. Pinned.